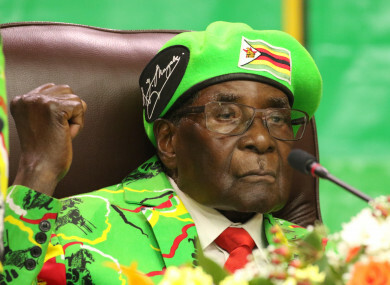 ZIMBABWE PRESIDENT ROBERT Mugabe was meeting with a South African delegation at the state house today as negotiations pushed for a resolution to the political turmoil and the likely end to Mugabe’s decades-long rule. South Africa President Jacob Zuma, speaking in parliament, said the political situation “very shortly will be becoming clear” but that it was too early to take any firm decision. The talks include the military and, reportedly, the Catholic church. Seizing on the political limbo to speak out, civil society groups and opposition leaders urged Mugabe to step aside after 37 years in power and for the country to transition into free and fair elections. Most people in the country have not known a time without Mugabe, who has been at the epicentre of public life since coming to power in 1980 on the country’s independence from Britain. The nation was left stunned after the ailing leader was confined to his residence late on Tuesday as soldiers took up positions at strategic points across Harare and senior officers commandeered state television. A joint statement by more than 100 civil society groups urged Mugabe, the world’s oldest head of state, to peacefully step aside and asked the military to quickly restore order and respect the constitution. A joint statement by churches also appealed for calm. Though nothing has been heard from Mugabe or his wife Grace directly since the start of the army operation, many Zimbabweans are hopeful that the crisis will mark the beginning of a more prosperous future. We hope for a better Zimbabwe after the Mugabe era. We feel very happy. It is now his time to go. Harare’s residents have largely ignored the military presence on the streets and continued commuting, socialising and working much as normal, while analysts speculated that Mugabe and the army could be negotiating a transition. Derek Matyszak, an analyst at the Pretoria-based Institute for Security Studies, said he expects Mugabe and the military are thrashing out a handover to a new head of state. “I think Mugabe can still stay in the country. I think they would like to present him as a liberation icon and accord him due respect. The international community will also be watching the next phase of the crisis closely. Yesterday, the African Union issued an unusually terse statement that said the situation on the ground “seems like a coup” and called on the military to pull back and respect the constitution. Britain, Zimbabwe’s colonial ruler until independence, called for calm and warned against handing power to an unelected leader. “Nobody wants simply to see the transition from one unelected tyrant to the next,” said British foreign minister Boris Johnson. Zimbabwe’s army was set on a collision course with Mugabe last week when he abruptly fired his vice president Emmerson Mnangagwa — a lynchpin of the defence and security establishment. Mnangagwa, 75, was previously one of Mugabe’s most loyal lieutenants, having worked alongside him for decades. He is often referred to as ‘crocodile’ because of his political cunning. Mnangagwa fled to South Africa following his dismissal and published a scathing five-page rebuke of Mugabe’s leadership and Grace’s political ambition. There are now reports that he has returned to Zimbabwe. Army chief General Constantino Chiwenga gave an unprecedented press conference on Monday, flanked by dozens of officers, and warned Mugabe that he would intervene if the president continued to purge the ruling ZANU-PF party. Mnangagwa has been embroiled in a long-running feud with Mugabe’s wife Grace, 52. In a sign that the military was purging the first lady’s backers, a Grace loyalist widely reported to have been detained by the army appeared on state TV late on Wednesday. Kudzai Chipanga, leader of the ZANU-PF’s youth league, apologised for criticising Chiwenga following the general’s threat to intervene against Mugabe. “I kindly request General Chiwenga to please accept my apologies on behalf of the youth league and myself. We are still young people, we are still growing up. We learn from our mistakes,” said Chipanga, who shifted uneasily as he read the statement. Email “Zimbabwe crisis: Mugabe in talks with South Africa to find resolution to country's turmoil”. Feedback on “Zimbabwe crisis: Mugabe in talks with South Africa to find resolution to country's turmoil”.